Celebrating 30 Years Making Offices Shine! When customers visit your office, you can never replace their first impression. They will notice if your office shines. Just as importantly, your employees deserve a clean, healthy environment to be productive. When searching for a commercial cleaning service, choose experience, an excellent reputation and superior customer service because you deserve the best! In the United States, a typical workplace contains an average of 500 different types of bacteria. The Gemini Janitorial Services team ensures every surface and source of bacteria has been cleaned properly. 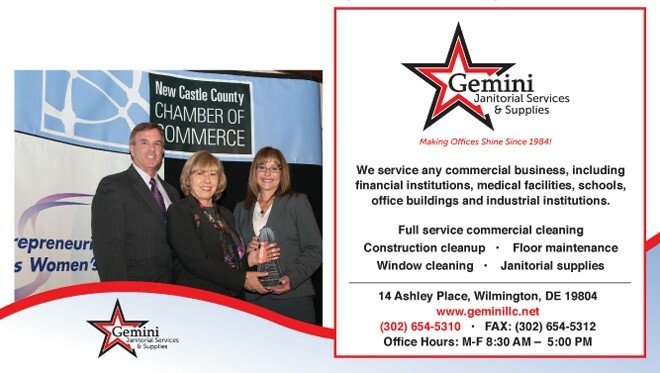 Since 1984, Gemini Janitorial Services has been cleaning professional offices in the Greater Delaware Valley. In addition to commercial cleaning services, we offer a line of environmentally-friendly products and supplies. 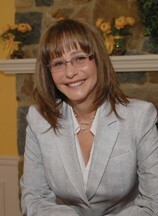 The company was founded by Janet Killian, current President and CEO. Janet is certified as 100% owner by the Women’s’ Business Enterprise National Council. Janet was recognized for her leadership skills as the 2014 Entrepreneurial Woman of the Year by the New Castle County Chamber of Commerce. The Gemini difference is the dedicated people who work for the company. Listening to her employees is very important to Janet. She gets to know them, their strengths and personalities. She is frequently out in the workplaces being cleaned, training and learning. With determination and a positive attitude, she worked hard to build a well-managed and profitable business. Every new customer receives a site inspection and a customized plan to clean their facility. Together, a plan will be created customized for your facility. You will then receive a detailed proposal, based on your specifications. Frequent joint inspections will insure that your specifications are being met. Over time, it may be determined that certain cleaning tasks need to be scheduled differently to meet your expectations. Medical offices and facilities are our specialty. Our team understands the unique needs of the medical community. You can rest assured that we will make sure that all equipment, surfaces and floors are sanitized to prepare for new patients and visitors. Call us today to schedule a site visit. We provide long-term value since we become part of your team. ← Previous Story Spring Cleaning! Think PANACHE Furniture Consignment!